The zoom tools allow you to focus in on a particular area, or pull out for a wider view. You can use a mouse, or keystrokes, or a combination of both. You use the majority of these tools within an existing view. However, a zoom window must be open to use the Magnifier and Pan tools. Zoom in Works within the existing view. Zoom out p Works within the existing view. Zoom original Vp\ Restores the original level of zoom. Works within the existing view. Zoom previous < - Restores the previous zoom. Use this to switch between the last two zooms. Works within the existing view. Create zoom window Creates a new zoom window from an existing view. You can only create zoom windows from wire frame views. The zoom window contains two additional commands, Magnifier and Pan. Active window The commands below Active window automatically zoom the active window. So you do not need an extra click to complete the command. Use the Zoom in tool to focus in on a specific area of the model. The Zoom out tool pulls out for a wider view. Both work within an existing view window. How you use the zoom tools depends on the pointing device you are using: a 3-button mouse, or a wheel mouse. 2. Click the zoom in or zoom out icon on the Zoom toolbar. 3. Click the area of the model that you want to examine. 4. Continue to click to zoom further in or out. • In mouse-wheel mode, scroll the wheel to zoom in and out. 4. Scroll forward to zoom in, scroll backward to zoom out. 2. With the mouse cursor over the model, press Page Up to zoom in, Page Down to zoom out. Centered zooms To keep the center point of the view in the middle of the view window, regardless of the position of the pointer, check Centered zooms on the Setup menu. If Centered zooms is not checked, the pointer does not move. Zoom ratio The following variables control how much you zoom in or out with each click. mouse. The default value is 0.25. Increase this value to zoom in or out more with each click. wheel, use the variable XS_ZOOM_STEP_RATIO_IN_MOUSEWHEEL_MODE. To set the zoom ratio when scrolling and holding down the wheel, use the variable XS_ZOOM_STEP_RATION_IN_SCROLL_MODE. and Pan These appear on the toolbar within the zoom window. You can only create zoom windows from wire frame views. 1. In the View Properties dialog box, click Wire frame in the View type list box. 3. Click View > Zoom > Create Zoom Window. 4. Click a starting corner for the zoom window, then drag the pointer to size the window. Release the mouse button to create the window. 5. Move the zoom window to a convenient location on the screen. 6. Resize the zoom window by dragging the window boundaries. The Magnifier is useful when you need to keep a general view of the model open, and examine particular areas in detail, at the same time. Click the Magnifier icon J in the zoom window. As you move the pointer in the general view, the zoom window displays the area around the pointer in detail, as shown in the example below. Change the level of magnification by zooming in and out in the zoom window. 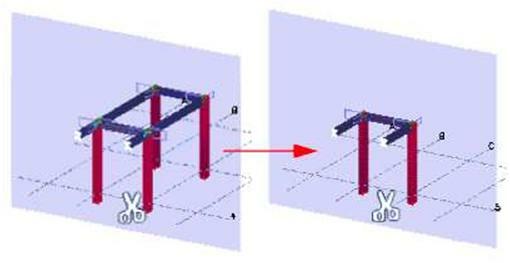 In Tekla Structures you can move, pan, rotate or fly through a model, in the view window. The Move commands move the viewpoint (or camera) rather than the model itself. Use the up, down, left and right arrows on the keyboard to move the viewpoint. You can also click View > Move to use the move commands. To center the model on a particular point, click View > Move > Center by Cursor, then click anywhere in the view to center the view on that point. The Pan command moves the model itself. Activate dynamic panning using the P key on your keyboard, or click View > Move > Pan. The pointer will change to a hand. Click and drag the mouse to move the model anywhere within the view window. You can also pan while using the Fly command. To do this, activate the Fly command, and use the middle mouse button to pan when needed. You can use keystrokes, menu commands, the mouse, or a combination of these techniques to rotate the model. the Ctrl key and click and drag with the middle mouse button. 1. Press the V key. 2. Click to pick the new center of rotation. 1. Use the keystrokes Ctrl+R. 3. Click and drag with the left mouse button to rotate the model. 4. Use the Esc key or Interrupt to end rotation. rotation is fixed in the center of the work area. Click Esc to stop rotation. Snap switches affect model rotation. For example, with Free active, you can click anywhere to define the center of rotation. If Free is inactive, you need to pick an intersection point, or the end of a part. 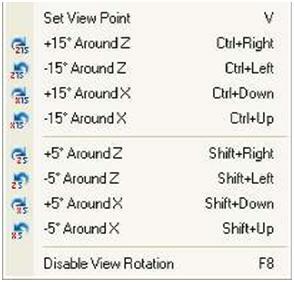 Disable view To disable or enable view rotation, click Window > Rotate > Disable view rotation, or use F8. 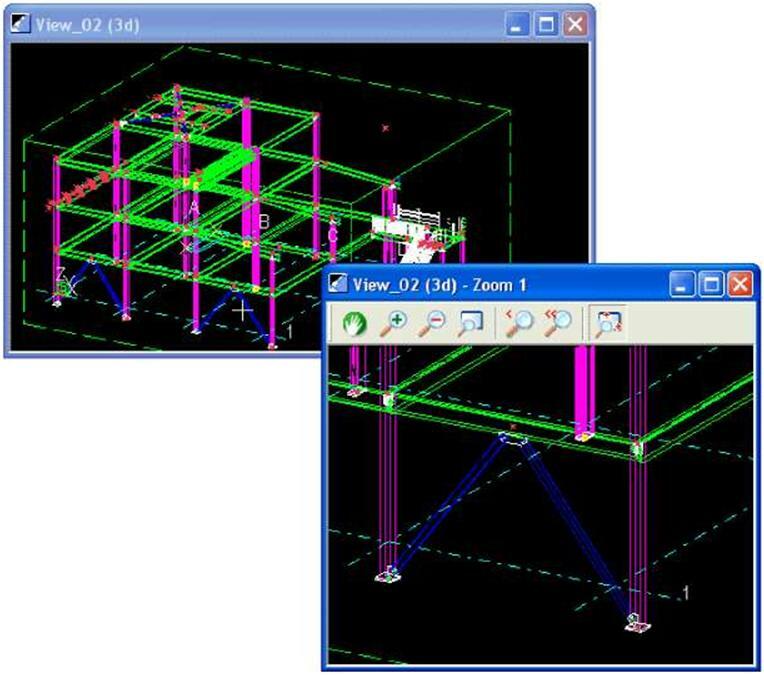 In Tekla Structures, you can travel through a model, changing direction and varying speed as you go. To fly through a model, you must have a rendered view open, with Projection set to Perspective. See View properties for more infromation on how to change view properties. Use the keyboard shortcut Shift+F to start flying though the model, or click View > Fly. Pick the view to fly in.Tekla Structures displays an arrow symbol to indicate the flying direction. To adjust your flying speed, move the mouse to the desired flying direction. The flying speed grows exponentially when you are approaching the model from a distance. To fly forward, move the mouse forward. To change the flying direction, move the mouse to the desired direction. 1. To change the level you are flying on and to go straight up or down, hold down the Ctrl key and move the mouse forward to go up, and backwards to go down. Release the Ctrl key to continue flying on a level. 1. To change the camera angle, scroll with the mouse wheel. To fly in the in the direction of the camera angle, hold down the Shift key and scroll forwards to go down or backwards to go up. 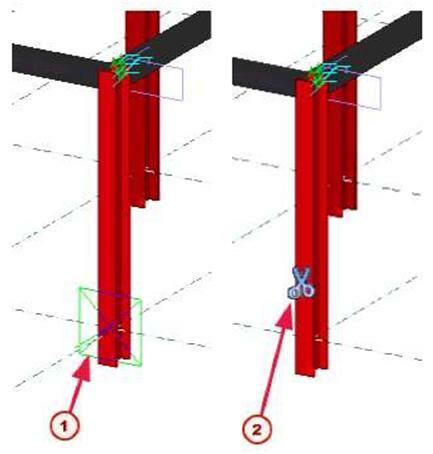 In Tekla Structures, you can create up to six clip planes in any rendered model view. Using clip planes enables you to focus in on the required detail in the model. 1. Select a rendered model view. • Click View > Create clip plane. 3. To select the position of the clip plane, click a plane. 4. To finish, right-click and select Interrupt. To move the clip plane, click the symbol, and drag it to a new location. To delete a clip plane, click the clip plane symbol and press Delete.